Did you know that there are over 30,000 farmers in Oregon, but only about 300 are owned and operated by women? 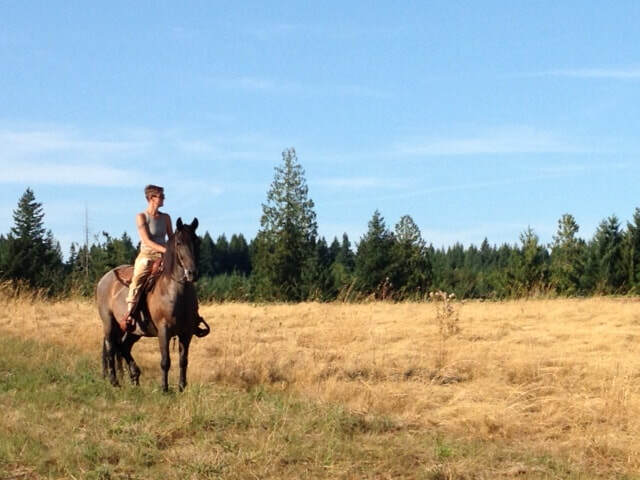 Located on 75 acres in Beavercreek, Oregon, Naked Acres Farm is one of these rare farms. 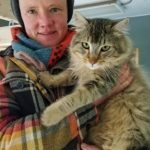 Growing up on opposite sides of the country, Augustus (Gus) and Margo met in June 2011 through a love of the land, farming, and horticulture. Gus grew up east of the Cascades in a small farming community. 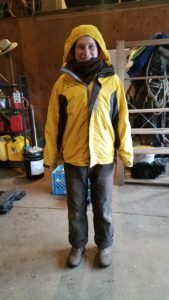 A hands-on kind of gal, Gus grew up driving tractors, learned to weld in the Navy, and studied veterinary medicine. Margo grew up in Maryland, with her love of horticulture taking her to Syracuse, New York to study Environmental Biology. 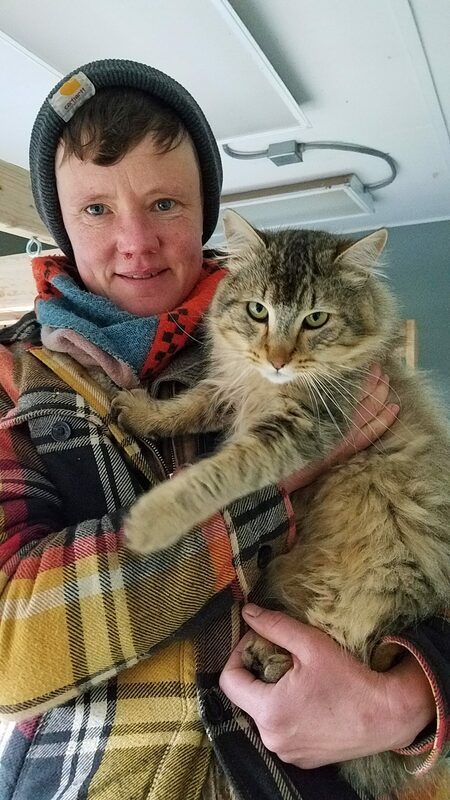 Upon graduation, she came to Oregon and worked for the Forest Service in addition to doing landscaping, where she met Gus. 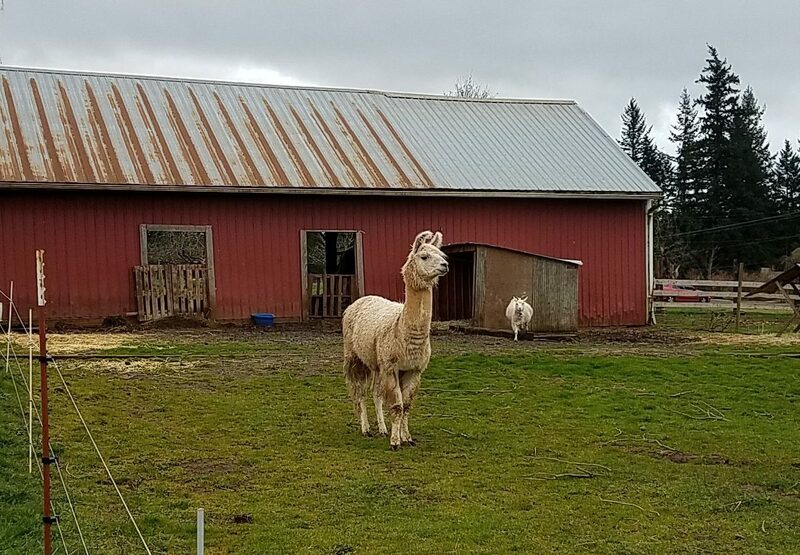 Their first farm was on three and a half acres in SE Portland. There they started in 2012 with goats, chickens, lettuce, vegetable starts, and the unique purple calabash tomatoes. Getting the farm cultivated was physically demanding – brutal might be a better description. Using only a broadfork to turn and prepare the soil, three and a half acres seemed like a hundred. Determined to make a go of it, they headed to their first farmers markets in May 2012. 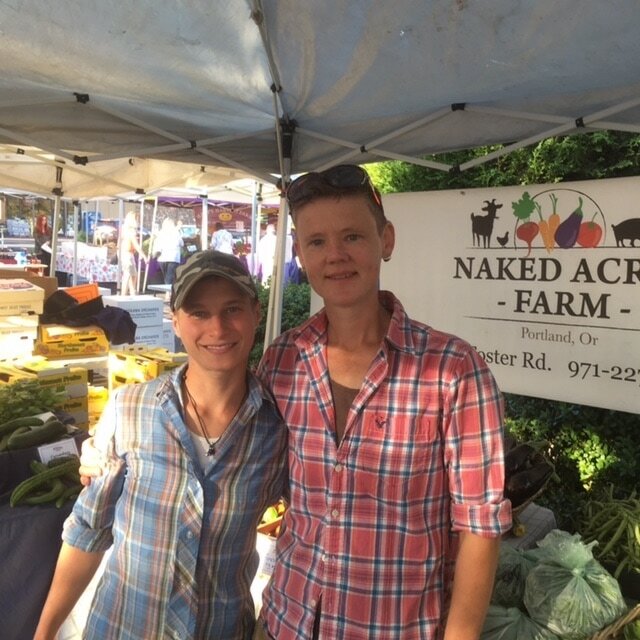 They were so excited to make a couple of hundred bucks and literally see the fruits of their labor, that the Naked Acres Farm booth soon became a regular stop for many customers at the Hollywood Farmers Market. As part of a five-year expansion plan, in 2017 Gus and Margo moved Naked Acres to a 75-acre farm in Beavercreek, Oregon. The wide open fields were perfect for the type of farming they wanted to do. But the move was not smooth sailing. The first year on the new farm was just as challenging as the first one. 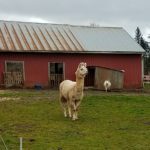 They were starting from scratch, the plantable acreage was small, the main house was occupied by farm animals and rodents and trash, and it was going to take time to cultivate and plant the first crops. Endless days ran into endless nights, with Gus and Margo working just to have a place to live. Produce was limited in that first year, but the chickens and goats helped to sustain the farm and ongoing investment. In spite of all the challenges, they brought to market tomatoes, carrots, kale, trademark striped Roma and purple calabash tomatoes, Pak Choi, kale, and hot and mild peppers. They also continued their line of preserves, including zesty dill pickles, homemade salsas, and tasty tomato juice (makes great base for gazpacho), as well as free-range heritage meat birds, hand-washed eggs, and their fabulously, creamy, hand-made goat’s milk soaps. Not only is farming an act of love, getting to market requires tenacity as well. The process of preparing for market runs from sunup to sundown. Fridays start early in preparation for the next day. Harvesting, gathering, sorting, and collecting produce; hand washing dozens of eggs; and packing everything is an all-day activity. On market days, rain or shine, Gus and Margo pack up their Ford truck and head for the Hollywood or Hillsdale Farmers Markets. The day is consumed with loading the produce and other products, traveling to market, setting up shop, taking it all down, and maybe some sleep after everything is done. The forty-minute drive from Beavercreek, Oregon is one they love to make – even when the wind is whipping everything around like a Tasmanian devil, or the rain turns cold and icy. The farmers market is a big part of their social connection with the community they serve. Farming is a labor of love and dedication but not a lot of social connection, so the market is a great way to be with the community and other farmers. And they get to share a wealth of knowledge that their customers appreciate. With the aid of a rented tractor (that sometimes gives up), this year is off to a good start, and yields are expected to be substantially better. The hothouses are already filled with starts in preparation for planting six to eight acres in the spring. In addition to their fresh produce, eggs, and chickens, Naked Acres offers canned goods such as hot sauce, pickles, green tomato relish, low sugar jams, and syrup. Summer Community Supported Agriculture (CSA) in full or half shares have been added to the list and can be picked up at specified drop sites or at the Hollywood and Hillsdale Farmers Markets (get a market discount). Recently Gus and Margo were awarded a contract for hot peppers which will help to speed up their expansion. On the recent farm tour, Gus and Margo educated me on their livestock: Goats, pigs (Old Spots, with their floppy ears and Tamworth, often called “bacon” pigs because of their very long bodies), the 250+ Heritage chickens that freely roam the farm, sheep, and the new addition of Hereford and Dexter cows which can be found grazing in some of the uncultivated acres. Llamas, used for livestock protection, watch over the goats. Donkeys keep an eye on the sheep. Using beneficial bacteria for fungi and nematodes (microorganisms), and Marigolds to keep insects away. Eliminating most kinds of typically accepted sprays. Hand washing their eggs on Friday before market. Hand picking slugs and worms off produce. Crop rotation and soil amendments based on soil testing such as a mixture of chicken manure, lime, and an organic blend of fertilizers. Produce is washed by hand, then moved to a temperature controlled room that serves as a cold room in the summer, and a warm room in the winter and early spring for germinating seeds. To provide produce throughout the winter months, vegetables like winter squash, leafy greens, cabbage, and broccoli are harvested in November, and then go into another temperature controlled room. Their commitment to farming also includes educating future farmers. Margo is on the Hillsdale Farmers Market board. Gus is on the Oregon Pasture Network board and is active with Friends of Family Farmers. 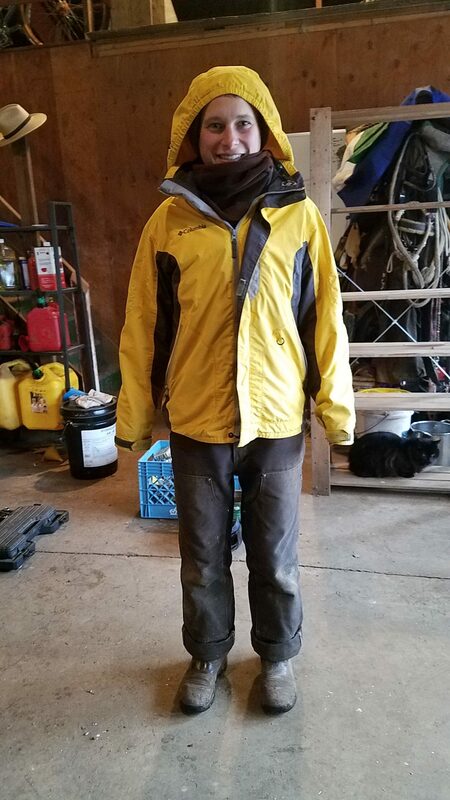 Interns play a vital role on the farm, in exchange for a hands-on education, room and board, and a stipend. The interns help offload many of the daily chores, have helped install irrigation lines, and are in the process of building a functional workspace. Currently, two extremely competent interns live on the farm. Gus said that four or five to cover a full season would be optimal, so if you know someone, direct them to the Natural Resources Conservation Service (NRCS). WWOOFers (World Wide Opportunities on Organic Farms), who are usually short-term and part-time are also welcome. Gus and Margo are committed to farming as a way of life, even with all its challenges. Their goal is to expand the available cultivated acreage, increase output, generate a steady stream of income, and have a tractor that runs without breaking down. Stop by and meet these remarkable women at the Hollywood Farmers Market.